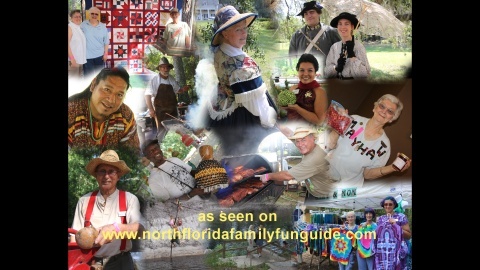 The biggest and best Folk Festival in Florida happens Memorial weekend of every year, and is filled with music, storytelling, living history demonstrations, indian life demonstrations, and pioneer craft demonstrations, and so much more. Stephen Foster Folk Culture Center State Park, is the host of this fabulous annual event. The festival covers several acres with 8 stages , plus workshop tents, and jam tent areas. It's a good idea to bring a golf cart, or a bicycle to comfortably cover this expansive festival, to see as much as possible. Music is everywhere here at this festival, representing all kinds and flavors of Folk music and original music, in an acoustic genre. Contra dancing, line dancing, ethnic dancing, are ongoing throughout the festival. The food represents the best vendors in Florida, with choices like barbeque, greek flame food, homemade ice cream, carribean flavors, and more! The children's Tent was busy with special featured musical performances, puppet shows, arts and crafts, and even a parade to show off their efforts. Come to the Florida Folk Festival on Memorial Day weekend and bring your family for a diverse, culturally enriched, crafty, and musical weekend!